June Flowers/Tulip Tutorial | OccasionalPiece--Quilt! 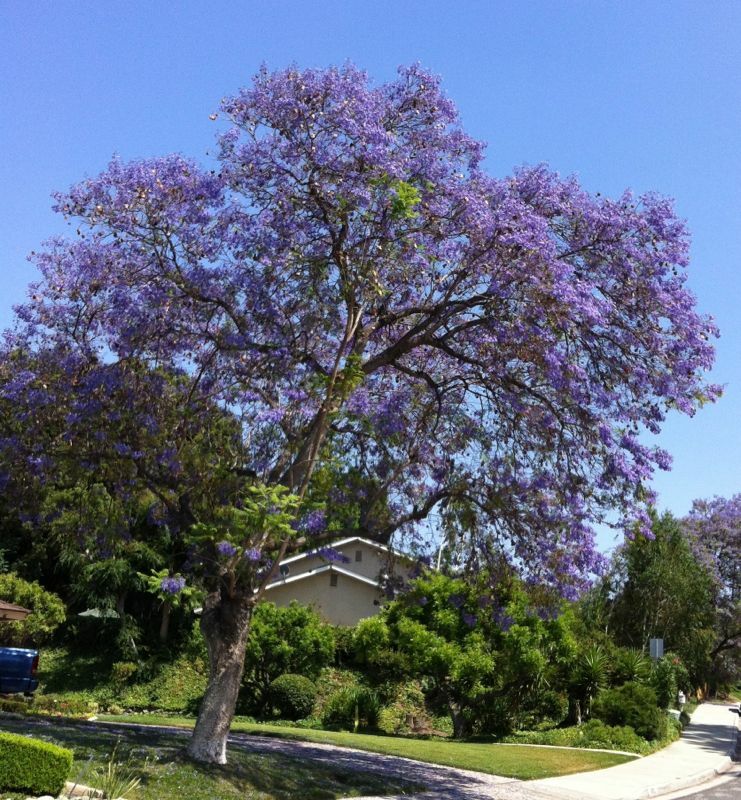 Posted on June 10, 2012 by Elizabeth E.
Every June the jacaranda trees put on their bluey-purple-periwinkle display of flowers, and we all wander around wondering how we got to be lucky. And like clockwork, every June they dominate my photos — exquisitely colored blossoms on hills, around bends while the rest of the year these trees blend into the landscape. 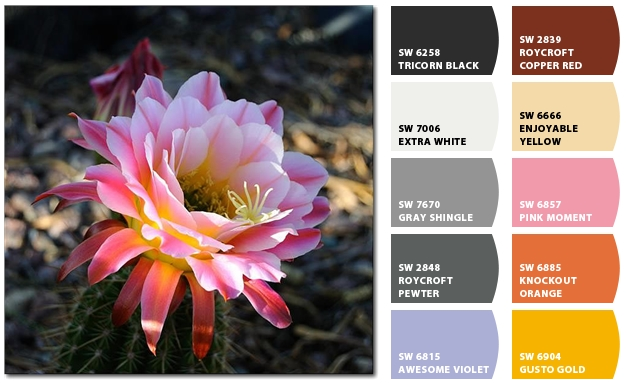 And I’m heading to a class with Becky Goldsmith (the designer of the quilt I did last year: Come A-Round) and we’re doing a flower in class, so I chose a night-blooming plant for color inspiration for fabrics to pull. This comes from the Sherwin-Williams paint website “Chip It,” where you load up a URL of a photo and they provide their colors. I just like how it looks, and it helped me pull from my stash. So when it came time to decide on a block for the Far-Flung Bee, that was easy: a flower. I also wanted something of simple construction (9-patch) because of my fabric requrements–I wanted some fabrics with text to be incorporated into the blossom. Here are two versions of that tulip/flower block, and the text fabric is used two different ways; one is in the background fabrics and the other is included in parts of the flower. That green fabric saying Blah Blah Blah is a treasure for me as my friends Bert and Rhonda sent it to cheer me after my surgery in December. I’ll always think of them when I use those fabrics (thanks, guys!). So here’s how to do it. 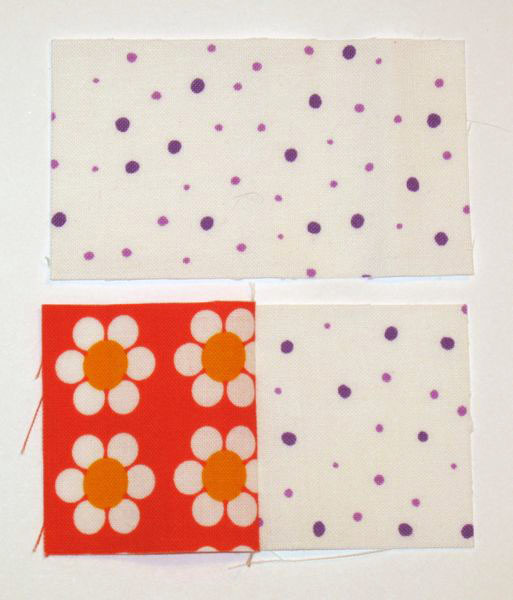 Working with the 3 7/8″ squares ONLY, place one background square on each of the flower and leaf blocks. Draw a diagonal line from corner to corner, or if you have the Quick Quarter tool (shown above), draw a line on either side. 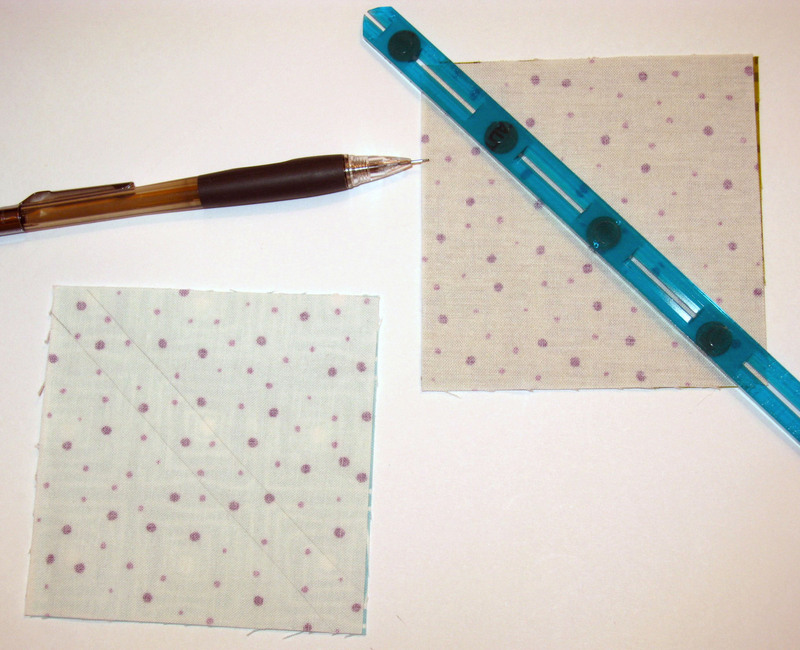 You’ll stitch just inside this line (towards the center), or if you have drawn a single diagonal line, you’ll stitch a SCANT quarter-inch seam on either side of your drawn line. 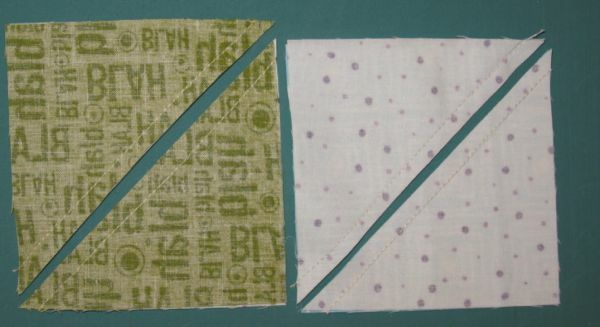 Cut from corner to corner, inbetween your stitching. 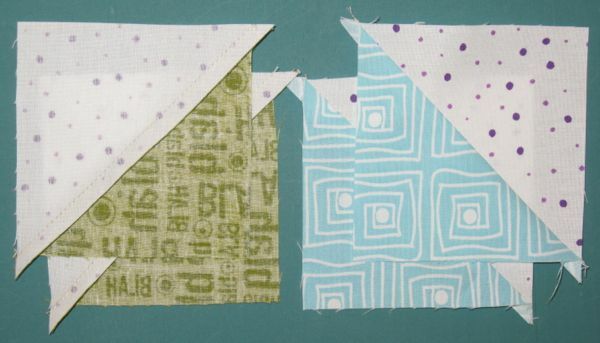 Press the seam allowance away from the background triangle, as shown. Notice those dog ears on the corners? We’ll cut them off later. 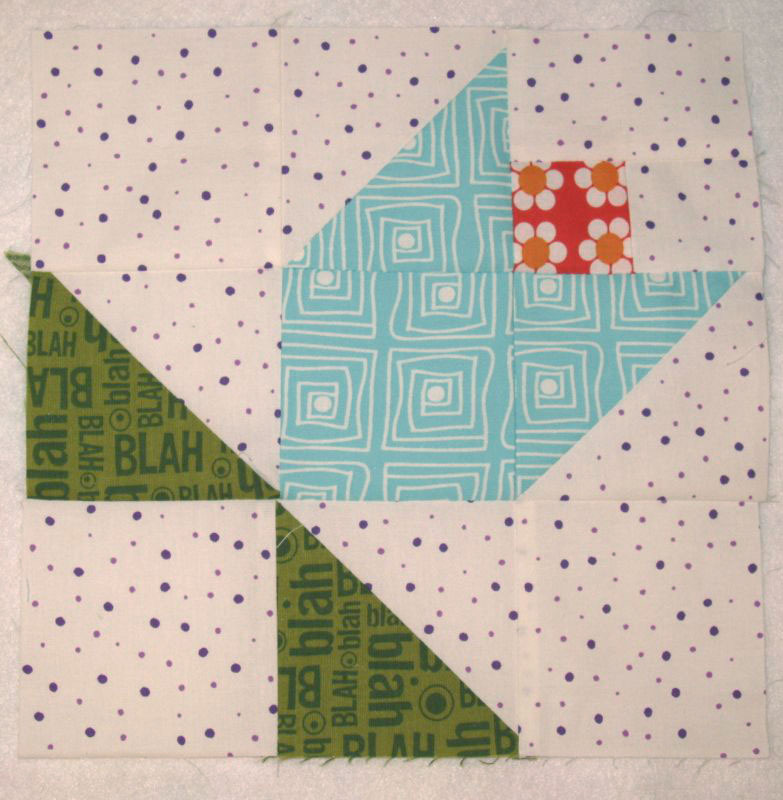 Working with the 2″ square blocks and the one rectangle now. 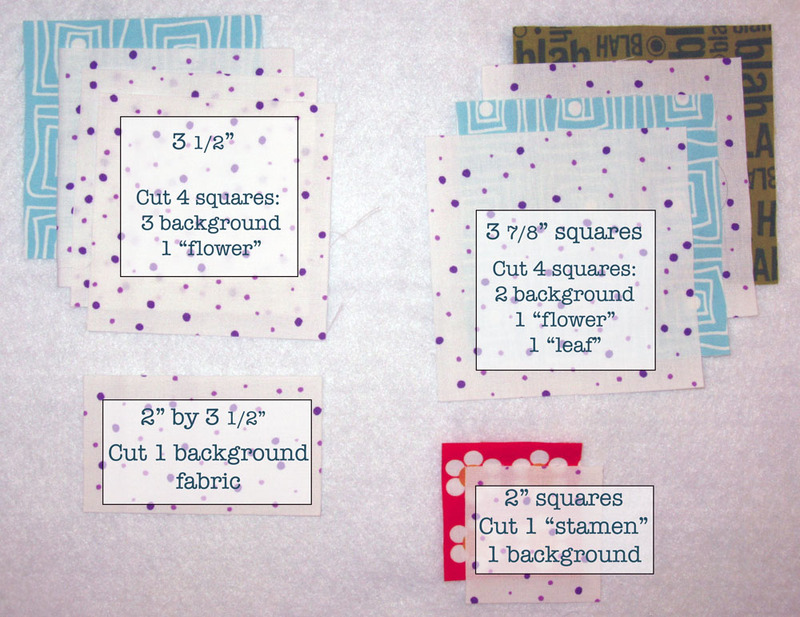 Seam the stamen fabric block to other 2″ background fabric block. If you’re like me and getting up and down to the ironing board gets tiresome, just finger press that seam towards the stamen fabric. 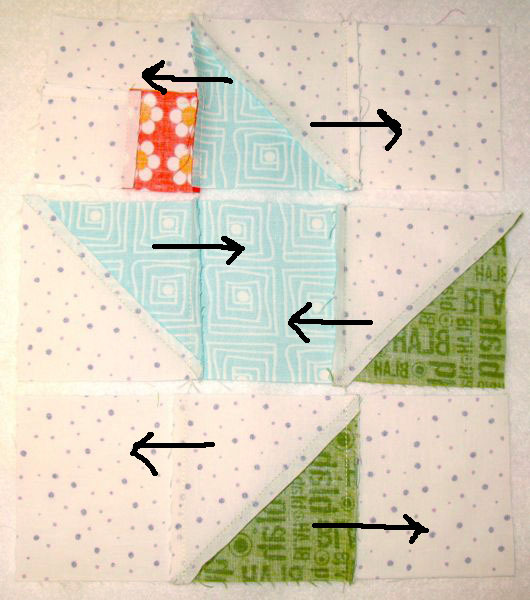 Then seam the rectangle onto this unit. Okay, now go to the ironing board and press that flat. Lay everything out. Smile, because it looks cute. AND it’s fast! Seam them together in rows, working across the block. Keep track of which direction that bottom leaf goes. I did it wrong twice. 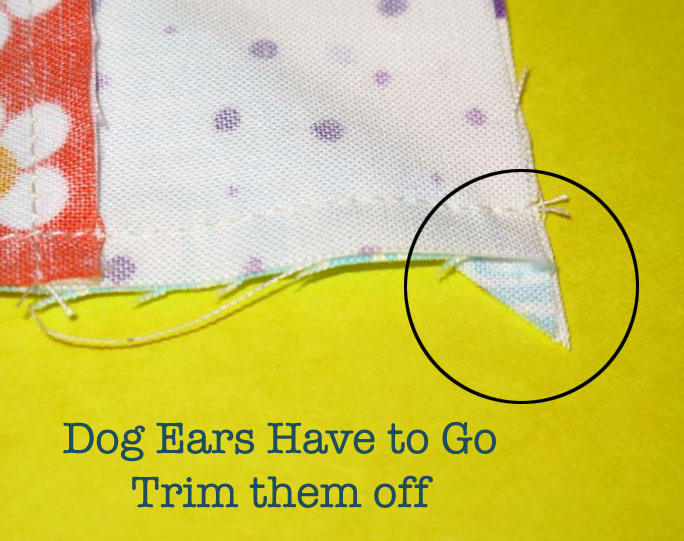 Now it’s time to trim off those dog ears. (I actually trim them as I seam the pieces together, not waiting until a final moment, but this is just a reminder to get them off now). I use that old fashioned tool that works so well: scissors. Snip snip snip while holding it over the trash can. I’ve flipped it over to show the directions for pressing. Basically you want to have the seams going in opposite directions so they’ll “nestle” together when you go to sew the rows. Lay it out again, the sew the final seams, joining the rows. Double check that bottom row twice, so you don’t sew it in wrong (like I did). You’re finished with one block. Eat Your Vegetables, by laying a ruler over it and truing up the block to 9 1/2″. 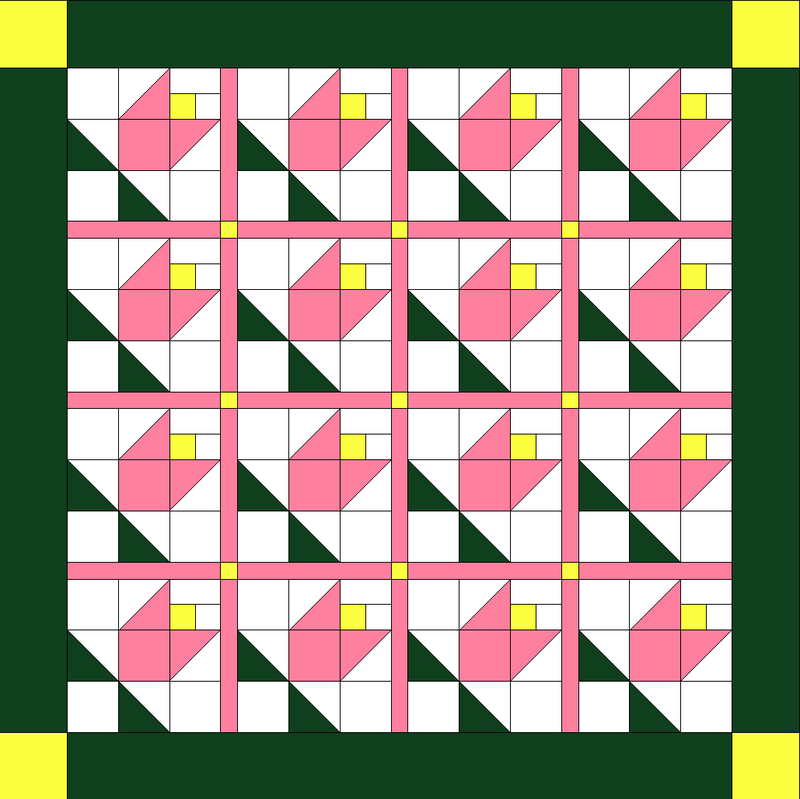 It will sew down to a finished 9″ block in your quilt. 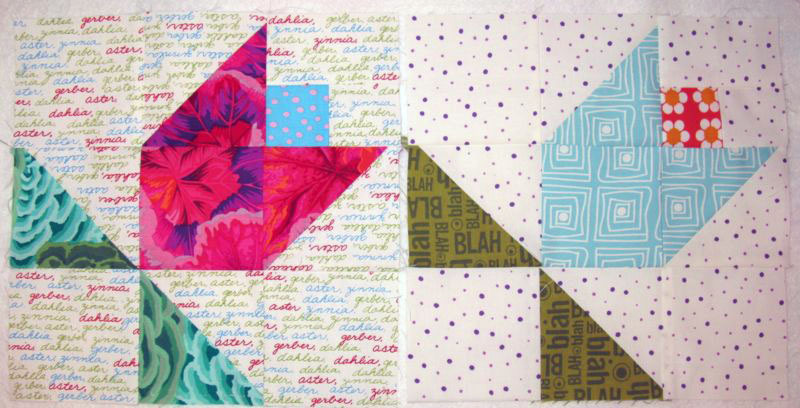 Here’s a mock-up of one layout, using 1″ sashing and corner squares. 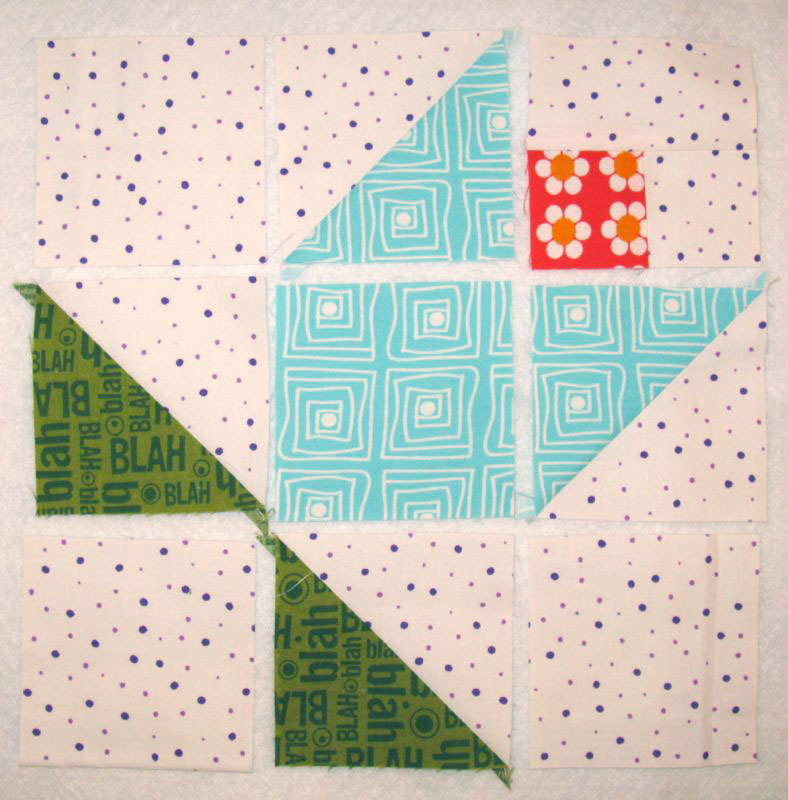 I’ve also thought that since it’s based on an easy nine-patch block, that a grouping could be made of half-sized (4 1/2″ finished) blocks that could be interspersed for a more random look. That’s for another day. Beautiful jacaranda tree. I can see why you take lots of pictures. Great tutorial. Great photoshopping skills. I’m completely impressed with it all. what a beautiful tree. i have never heard of it before. what state do you live in? Love the Jacaranda tree! It was one of my mother’s favourites! Your tutorial is so detailed-thank you! I think I might just have to make one so I can have some Spring on a cold, cold Melbourne day! 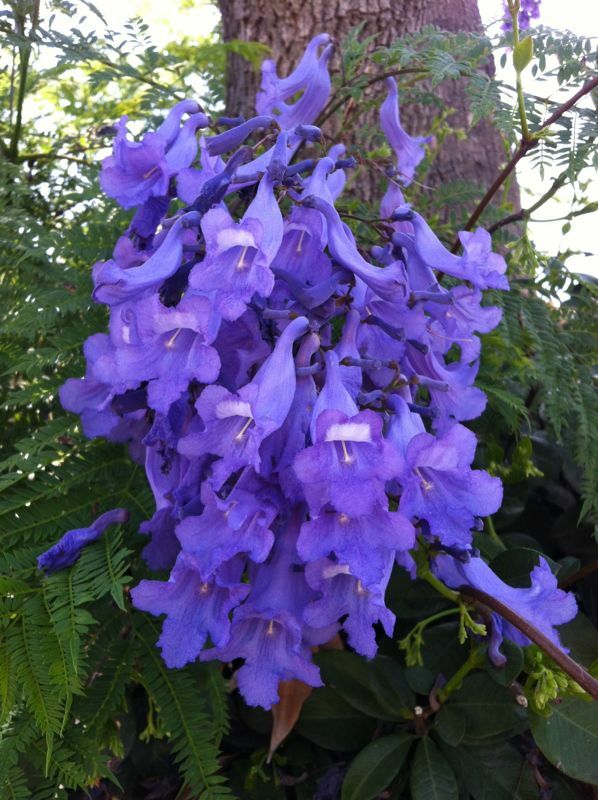 Jacarandas are so beautiful — all the purples and blues!